Whether it’s a side dish or a main dish, this Baked Creamy Cheesy Corn Casserole is a huge family favorite! This dish is one my Mom didn’t make often as I can only recall it a few times her making it but when she did make it I went nuts over it. Now her recipe was pretty basic and it didn’t call for heavy cream – she used condensed milk and onions. Now I’ve grown to appreciate them and even love them in some dishes but not in this. No, not in this. Well due to her not making it that often I honestly forgot about it. It wasn’t until a month or so ago I saw on Pinterest something similar to what Mom used to make by Chef-In-Training (love her site btw!) Immediately all those childhood memories came back and I had to make it. I looked through my old family recipes and found Mom’s and went to town. The only real difference between the two was one used all milk and the other used condensed milk. This type of casserole is pretty universal and standard – 2 eggs, 1 cup liquid, flour to make the slurry and butter. The change-up comes with the add-ins meaning corn, seasoning, cheese, crispy bacon and so forth. The base recipe is one to keep in your recipe files as you can go nuts with it on the variations you can make with it. Since I wanted that creamy texture I opted for half cream and half milk though you could most certainly go with half and half. I don’t like it with just milk as it doesn’t quite have that creamy consistency I prefer in my souffle-type-casseroles. As for the corn Mom only ever used fresh corn off the cob. Now she has used canned before but I can taste the difference. I like canned corn but nothing, nothing beats the taste of corn off the cob! Since I’m a think-ahead-type-of-girl I had about 5 quarts of corn off the cob frozen in the freezer. I grabbed a bag and had at it. This honestly can’t be any easier to make. I swear the hardest part of it all was figuring out if I wanted to put other stuff in it – bacon, cheese, chives, jalapeno and so forth. Trust me I could have so gone overboard with this! But to keep it semi-true to form, I left it almost the same except I garnished it with just a wee bit of Asiago. Why? Why not! I actually like the flavor marriage of sweet corn and Asiago. It just ‘makes sense’ to me. This dish cooks up in under 30 minutes and sets up beautifully. They key to any casserole is once you remove it from the oven, you need to let it rest for a bit to set and firm up. Kind of like lasagna. Did you ever take lasagna out of the oven and then immediately go to cut it only to have to fall into a big ol’ pile of mush; delicious mush but still mush. It’s not visually appealing at all. As I pulled this out of the oven Mr. Fantabulous walked by and looked at it, started to walk away, stopped and came back for a second look. He asked what it was so I said “it’s a corn casserole souffle-type thing my Mom used to make”. He then asked if he liked it. LOL Why do people ask this? I can barely remember what I like yet I am to know what you like? I said “Probably but I’ve never made it before. I forgot about this dish until recently when I saw someone post theirs.” He just shrugged, asked when dinner was and walked away. He’s so precious… While this was resting I got the rest of the dinner plated – creamy mashed potatoes, roasted chicken and honey buttered biscuits. I swear I really need one of those big ol’ dinner bells in my kitchen just because I want to see Mr. Fantabulous come running to the table. It’s funny as my Dad had one of those outside and would use it to ring through the neighborhood to let us know it was time to come home. He would ring it slowly 10 times and if he didn’t see us approaching the house by the time the last bell rung we were in big trouble. For me all it took was a single bite to fall back in love with this dish. It’s eggy and creamy, firm and corn-y. Er, you know where I was going with this. LOL Honestly I can’t say whether or not Mr. Fantabulous liked it because I was in my own little world during dinner thinking about this dish and just times when Mom would make it. It wasn’t until the next day when I made us a plate of leftovers for lunch did I remember just how AMAZING this is the day-after. Again, this is like lasagna and chili. Those 2 dishes are always better the next day. I’m not sure why with this – maybe it’s all the sweetness of the corn or the cheese or the cream but whatever it is, I literally could have sat down with the rest of the casserole dish in front of me and ate the entire thing! Definitely keep this recipe handy in your kitchen as it’s one you’re going to make often! This one certainly got bumped to the top of the recipe lists for sides in my kitchen! But wait, there’s more! If you want to make this a full-blown dinner casserole you can add in cooked chicken, turkey, pork or ham! Like I said, the list is endless! Lightly spray a 2 quart baking dish. In a medium-to-large saucepan over medium heat add in the cream, 1/4 cup milk, sugar and butter. While the cream mixture is heating up make a slurry of the flour and remaining 1/4 cup milk by whisking together until well combined. Whisk together the eggs until well beaten. Once the milk comes to a boil, add in the flour slurry and whisk until thickened slightly – ~30 seconds to a minute. Remove from the heat and add in the corn and salt mixing to combine. Slowly add in the eggs while mixing the entire time – you do not want the eggs to curdle. Remove from the oven and allow to cool for 10-15 minutes before serving so it can firm up and set. If you’re topping it with cheese remove the dish 25 minutes after baking. Sprinkle the cheese on and then return to the oven for another 5 minutes. Lori & Mr. Fantabulous I hope you had a wonderful Christmas. Aw thank you! Happy New Year to you and your family! How many persons does this recipe serve? It’s listed in the recipe. I go with 8 as a side dish. EPIC! This is a family must-have dish! Thank you for sharing! I will be making this for Christmas dinner once again! Everyone raved about it last year! The best corn casserole out there. Thank so much Jen! So happy you and everyone loved it! It’s one of my favorites too! Hello! Recipe looks great.! I was wondering if I wanted to take this to a friends house for dinner as a side, could it sit for a good amount of time in a hot bag? I saw that it has to sit for a bit, just wasn’t sure how long! They will probably be using their oven and I’d like to bring something that is already made. As long as it’s kept warm you should be fine. I mean I wouldn’t let it sit out all day but transporting from your house to theirs would be fine. 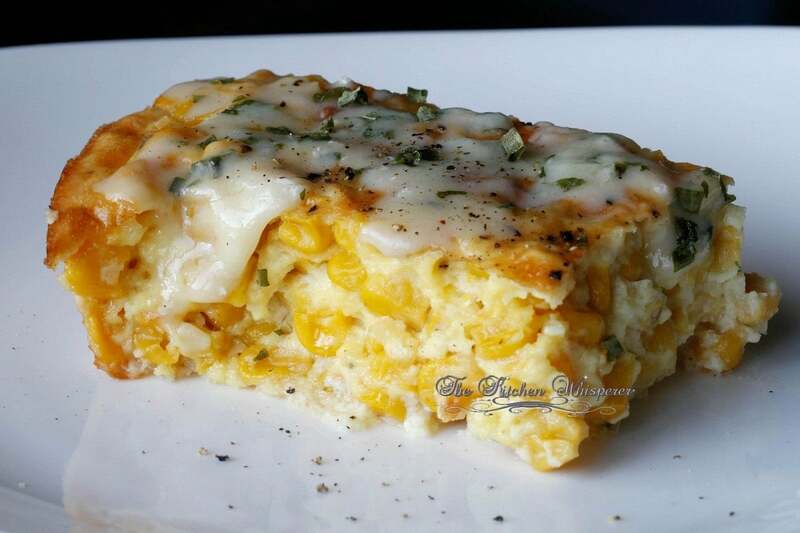 Best corn casserole ever ! rave reviews from family and friends ! Will be making this for many years to come ! Yeah!!! So happy everyone loved it! Any tips for re-heating? If I make today and want to serve tomorrow? When I’ve done it I wrap in foil and reheat at 350 till warmed through. Then I’ll uncover and heat another 5 minutes (if I add a sprinkle of cheese). Did you know that this recipe is not “pinning” to Pinterest? It says the title is too long to pin. Oh wow, thanks Suzanne! I sent a note over to my website developer (who’s on holiday right now). Hopefully they can fix that next week. Thanks! Can you make this ahead and cook it a day or two later and it still tastes just as good? I’ve personally not tried. It may not be as thick as the baked version but it would still be good. I’m thinking setting it to high for 2-3 hours should do the trick. Yummy! I used leftover grilled corn on the cob, cut off, of course. Substituted mexican crumbling cheese and added Tajin chili lime seasoning for a mexi street corn rendition. Oh that sounds almost like a Mexican Street Corn Elote! Love it! Terrific! Look forward to making it again. Used 10 ears, and kept the ‘corn milk’ to replace part of the regular milk – might have added more liquid. Also used 2 medium eggs, and will add a third next time (3 med = 2 large?). Great flavors! Great suggestion about the corn milk! Yes 3 medium are a bit more than 2 large but you’ll be fine in that substitution! Absolutely delicious! The flavors meld wonderfully. Love the flavor of Asiago cheese with this. Thanks for sharing Mom’s recipe with us! Hello wondering if you can freeze this recipe prepared and not cooked or would it be better to pre cook and then freeze ? I would bake them freeze. Freezing unbaked you risk it separating in the liquids. Just made this. It was delicious. 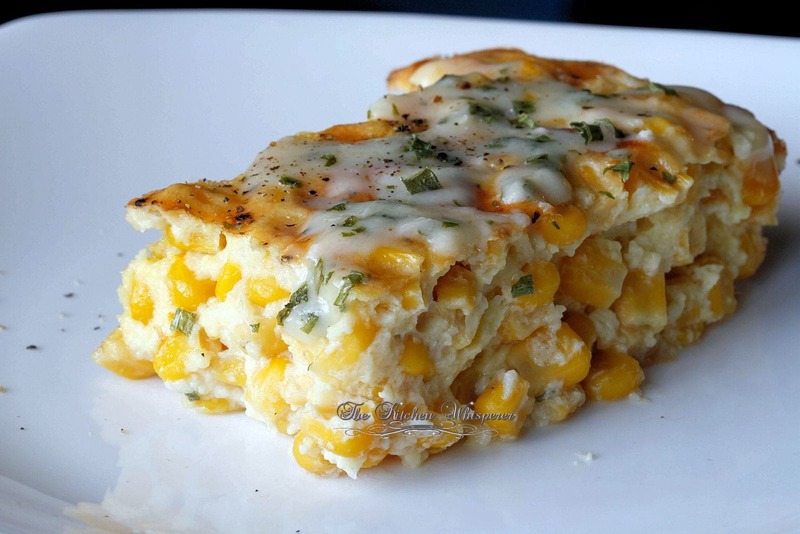 However what make this a casserole exactly and not just a side dish of creamed corn? I added bacon to mine so it kinda beefed it up but if ur not adding anything else its just creamed corn. Thank you so much! Creamed corn, that we’ve made and I’ve had, is more loose and not ‘cutable’. This casserole has more body to it which will hold a shape versus creamed corn which is thicker but still won’t really hold a firm shape. But I love the addition of bacon! I’ve added bacon, shredded chicken and made it a full meal. Can this be made the night before and baked when needed. Sorry I didn’t answer yesterday. We were having a surprise party for Mr. Fantabulous. Yes you can make this the night before and bake it the next day. You’ll have to cook it about 10-15 minutes longer. Thanks for the recipe that is made from scratch with NO canned, frozen or packaged ingredients! Can’t wait to try this over the holidays. You are most welcome! Merry Christmas!